Follow along with our adventures as we set out to convert a school bus into a beautiful,energy efficient home that runs off recycled vegetable oil. We then embark on a life long adventure, roaming the country, selling our handcrafted art and music as we go, meeting strange and wonderful people along the way. Crazy,naive,you ask ? Maybe,..maybe not.. Finally, we have arrived here in Brooksville Florida.We have been anticipating and dreaming of this day for almost a year now,when finally we get to see our bus and meet our internet friends! Greg and his wife Elaine are so kind ! We met Greg last November through the internet. I posted on a school bus conversion site that I was looking to purchase a school bus. Greg replied that he had a bus in great condition, with a rebuilt engine in fact and that he would sell it to us for 1,500. After a brief correspondence we decided to go ahead and purchase the bus and sent the first payment of 500 dollars. Greg held the bus for us at his place in Florida . He is a great guy and is allowing us to work on the bus at his place,and is even advising us on how to go about the conversion process. He has many to chose from, long ones, short ones, city buses, school buses, diesel, gas , you name it. His prices are more than reasonable,and he will even drive it to you for an extra charge. We are staying in our van as we work on the conversion, and have been here for three days already. So far, we have taken out some of the seats,and it has not been easy as the seats are bolted through the floor, requiring myself to crawl around on the ground with a wrench,while Moss unscrews it from above. There are three bolts to each leg and each one a different size !! Not shure why that is, but it is truly annoying. It is going to take longer than we thought to get the seats out,but just the fact that we are here and finally working on our home, is so exciting. A great side shot of the bus.Notice the billboard on the side.It used to belong to a driver trainning school in New York city. 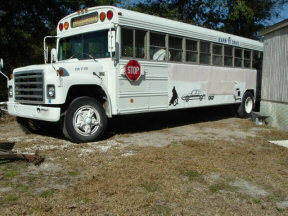 Our bus before the conversion. Note the marquee on top, it even lights up !! We left Washington state a few days ago for Florida. It feels good to finally be on the road, especially after all the difficulties we had there. First....on the way to Washington from California our power steering belt snapped. We had planned to get it fixed in Washington. Unfortunately, before we could, on one of those beautiful, rainy northwest nights Moss hydroplanned and because the power steering was out he could not conrol the car well. He ran off the road, hitting a tree and nearly totaling the car, thankfully he was not harmned. It cost about 700 dollars to fix it. Then about two hours after we set off for Florida, the hood flew up, smashing the window into a million pieces ! The latch was destroyed in the previous accident and the fellow who fixed it said we would do fine with a bungy cord~ yeah right, lesson learned. It was very scary as were on a narrow mountain road in Washington, Moss was able to see enough to carefully coast to the side of the road. After much screaming and hollering about our terrible luck we gathered our wits about us and made our way to the nearest town.There we met some very nice kids who helped us find a place to fix our window. 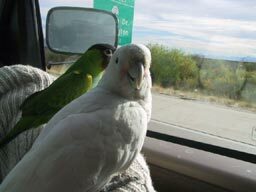 Casper and Joseph ( Goffins cockatoo right,Nanday Conure,left) enjoy the passing scenery as we make our way cross country to Florida. Greetings and welcome to our blog ! Yes, Moss and I have enthusiaticaly jumped upon the blog band wagon,and we will be updating it here regularly. Our blog will detail the adventures and life of Moss (a.k.a Marcus and darling husband ) our dog, Gaia, our four birds, (two starlings, Astra and Pipin, beloved cockatoo, Capsper and sweet Joseph the conure) and myself, Jennifer (a.k.a as Pixie) as we embark on an exciting journey. What is this journey/mission I speak, or more precisely, write of ?? The mission is many fold and involves, ultimately, a grand experiment, an experiment of life, of following ones bliss, and hopefully becoming self sufficient in the long run,by doing what we love. Where the future will find us, who knows, but it is in the journey that we rejoice. 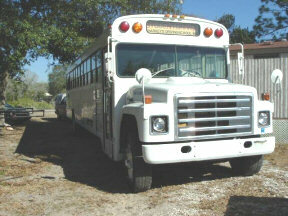 ~ Drive to Fla, Brooksville to be exact,where we will pick up a 36ft school bus ,convert it into a glorious home on wheels,complete with wood floors,solar pannels,bathtub and much more.The engine will be modified to run off of used veggie oil that we will obtain as we go from resturants. Some of those things are as follows, creating felt sculptures /dolls, making handspun yarn on my spinning wheel and dyeing it with natural dyes that I gather from roadsides and vacant lots . Knitting and weaving garments with my handspun, making felt boots, hats, and many other things that I have yet to learn. 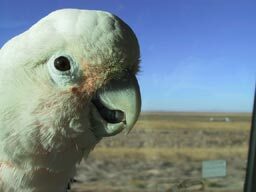 I stayed with them for two seasons as the bird specialist and worked out of my home. I also made some great friends and learned many new skills. Through the years, most of my experience has been with birds, everything from hummingbirds to raptors. It is something I truly love doing and miss dearly. As we travel about I will be stopping by and helping out at both large rehab centers and small private home rehbbers throughout the continent. In this way I lend a much needed hand, make new friends, learn new skills and keep my old skills fresh. Someday, we will purchase a nice piece of property somewhere, and open a small rehab center. For Moss,doing what he loves means playing live shows with his band H.R Funk n Puff, promoting his new c.d, Songs From the Electric Greenwood, as well producing, recording and writing new music. His current c.d is an amazing mix of classic psychadelic, bluegrass, folk and techno. He has worked very hard to put togeher a mobile rcording studio, one that enables him to go deep into the woods, where he finds much inspiration, and some GREAT sounds to record his music. He says he likes the idea of capturing the natural sounds and spirit of a particular place in his music. Weather it is next to a remote mountain stream in Alaska or an old cathedral in New Orleans. Along the way we will be promoting and educating people about the use of used veggie oil as a fuel souce. For those of you who know us, none of this will come as a suprise. We have been together for 11 years now, and from the start our living arangements have been, how shall I say,...unconventional ? Before meeting Moss at a rainbow gathering in Alabama,I had been hitchiking around the country on my own. I had some incredible adventues, even getting lost at sea for a month in a 12 foot sail boat with no motor or compass. But that's another story that I will tell another time. Moss and I traveled around for awhile in our purple VW van before settling down in an honest to god tipi for six years in Oregon, followed by a yurt for two years. The land was gorgeous, all 2000 acres, and consisted of oak savanahs, open medows and thick fir forests. We had no electricity or running water and our days were spent exploring the woods on foot and horseback, chopping wood, carrying water up the hill and cleaning horse stalls. I learned much about the plants and animals that shared the land outside our door. It changd me in very deep and profound ways, and I miss it very much. The natural world is my church, and where I see God/dess most clearly refleted in everything. Since our walls were made of thin canvas, we were always in touch with the natural world, even while bundled up, warm and comfy on a 20 degree night,open fire and wood stove roaring. Every sound is amplified, the wind in the trees, the crackle of a twig, the soft hoohing of the geat horned owls that lived behind our tipi. I could even describe to you about five different sounds of rain patter as it fell upon the tipi. LOL, it rains a LOT in Oregon. My favorite though was the sound of falling snow on the tipi canvas. By far the most unbeleiveable sound was in the Springtime. In the very early dawn, just as the first rays of sun began to light the forest, we would be awakened to what sounded like every single songbird in the forest singing at once, in unison. It almost sounded as though they were all singing the same song, but they re not.They all had there own species specific song , but when I tried to pick out one, I could not. It all sounded like one song. It ws so loud that we could not sleep through it and many days we just layed thre in awe, listening. Sigh......these are memories I will never , ever forget. It usually is those little things we cherish most though. So what happened ? The fellow who owned the land decided he wanted it to be a paintball/ORV park, so we had to go. It was very sad. Moss and I tried so hard to be good neighbors to all the plants and animals around us, and always said that when we left we would leve it just as we found it, without a trace of us left. We originaly came upon it by following a deer path, it was well hidden deep in amongst some trees. So, we cleaned up and left for southern C.A to stay with Moss's parents for a time. The week we left they bulldozed the entire place , trees and all, into one huge muddy parking lot for the paintball folks. Moss went back and saw this, I could not go. I wanted to remembr it just as it was when we left, a beautiful sanctuary to life. That is how it still lives in my mind. In C.A Moss went to school for audio engineering and I got a job as a vet tech for a spell, as well as running a rehab center out of the backyard. We stayed there for two years before deciding that the daily grind was just not for us. We left C.A just a few days ago and are now in Washington state doing a little work. We leave for Florida within the week to pick up our bus and begin a wonderful new adventure.